As one of the oldest producing hydrocarbon basins in the world, the North Sea has been a major contributor to European economies for fifty years, but what can we expect that contribution to be in thirty or fifty years’ time? 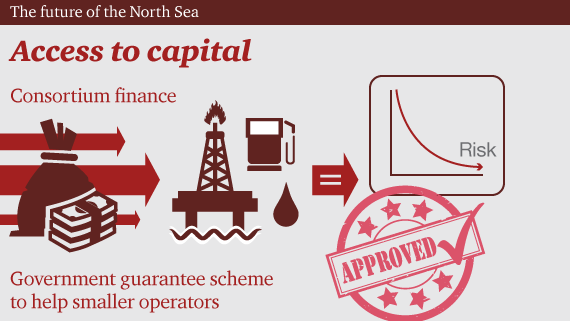 What does the future of the North Sea hold? Set against the backdrop of the Wood Review and “lower for longer” oil prices, the North Sea oil and gas industry is undergoing a significant period of change. And as the pressures to transition to a lower carbon world mount following the COP21 initiative, this may suggest the basin’s days are numbered. Or are they? We interviewed more than 30 senior stakeholders from the UK, the Netherlands and Norway, across the value chain in the North Sea. This report is the culmination of their insights and views on the state of play in the North Sea, alongside some potential solutions for sustainable success. The general consensus is that the North Sea does have a future. However, a number of fundamental issues will need to be addressed in the next 24 months if the basin is to avoid a rapid and premature decline. This wasn't top of mind for UK industry participants as they focus on cost reduction. In contrast, the responses from the Netherlands reflected a sector already planning an expansion of renewables post decommissioning. and overcoming them... but the next ten years will be very different to where we are now. Capital is vital for the future and different kinds of capital are needed across the life cycle. 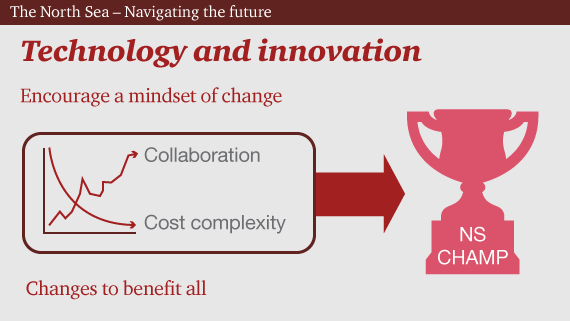 Innovations such as consortium financing, where counterparty risk is collective, could build an area or asset approach to a project rather than a company focused one. Government establishing clear support around decommissioning could also make a huge difference to smaller operators – a decommissioning guarantee scheme to lessen the burden of abandonment letters of credit for example. There is a real need for a “North Sea champion” – leading the way in innovation, best in class working and cooperation. And the mindset of the basin needs to change – truly embedding the notion of working together for mutual risk/reward. Cost efficiency is paramount and goes beyond cost reduction, especially when combined with a reduction in complexity and a leaner way of operating. Collaboration is an over-used word, particularly in relation to the North Sea – the key is ensuring there is real mutual benefit for all parties. A salient example could be the creation of a “super JV” which consolidates smaller and fragmented assets under one sole operator. Such a JV would boast scale for cost efficiency and ensure a better bargaining position vis-à-vis suppliers. This would also enable a more coordinated approach to the decommissioning of the asset pool. Additionally, this would be a fantastic opportunity for the kind of consortium based approach to financing mentioned earlier. Government and regulators across the basin have a role to play – from clearly articulating their vision for the future to signposting the way ahead on topics such as infrastructure ownership, encouragement for exploration, decommissioning and the transition to low carbon. They all need to set a blueprint for the future. Leadership is a vital component too – recognising the importance of our global centre of excellence in Aberdeen, and other regional centres such as Stavanger, and their true potential, as well as the economic benefit for the region are vital. Additionally nurturing the talent of the future to drive those truly transformative changes, are key traits of real leadership; in the industry, operators and the supply chain will need to show leadership. The elephant in the room is decommissioning but turning this to a positive could provide a further extension to the future by maximising efficiency from late life assets and exporting skill sets. Moreover, aligning our decommissioning planning to the transformation journey towards a lower carbon future would ensure a seamless transition and secure our energy future. The Super JV is an idea – a prompt for the industry to consider innovative and collaborative ways of working which reduce risk and increase cost efficiency, with the aim of making late life assets more competitive. This idea has been met with widespread interest in the industry, but also a general feeling that the mechanics might be unworkable. In this paper we set out seven key steps for the creation of such a vehicle whilst outlining the elements where industry needs to work together to create a solution. It’s worth stating that the Super JV may be one of many options for improving execution and cost outcomes, not necessarily the answer. But it is worth exploring. How will the oilfield service sector emerge from the crisis to position itself for future success in a new world? Oscar Wilde once said, “We are all in the gutter, but some of us are looking at the stars.” And to some extent that sentiment must resonate with many oilfield service (OFS) companies. The past two years has been a torrid time for the sector. Now there appears to be light at the end of the tunnel. With supply and demand seeking a gradual equilibrium, the oil price has recovered a little. Among some companies there is a growing confidence that perhaps we have reached the trough.